At 18 strategically located sites, Catholic Charities’ community service centers are a first point of help for people in need. The centers offer supportive services aimed at breaking cycles of poverty and homelessness in communities. Each center is unique in its approach and in its delivery of help, always responding to the community’s needs. 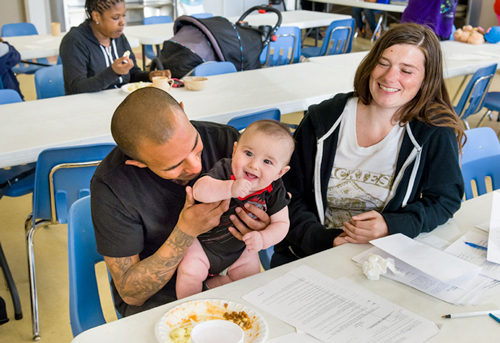 Catholic Charities provides food, clothing, rent and utilities’ stipends. Financial assistance for rent, utilities and transportation is subject to funding availability and may have geographical restrictions. Click here to find a community center near you. Emergency Assistance strengthens families and individuals in distress and helps prevent homelessness. Operating from the agency’s 18 community service centers, the assistance helps thousands of families stay together and maintain intact homes for their children. Services include: financial assistance for rent or utilities bills; fresh and healthy groceries; guidance in applying for state-sponsored health care; diapers; transportation assistance; and linkages to community resources. These essential services stabilize individuals and families when they most need it, thereby preventing domestic fractures that can have long-term negative effects. Individualized, results-driven case management is the cornerstone of the change that people in distress so desperately need. Working one-on-one with a case manager is a very effective way to gain clarity on one’s self, one’s hopes and goals, and one’s future. All shelter clients and some community center clients participate in the case management process, which identifies areas for improvement, short and long-term goals and steps to achieve those goals. The program strives to reconstruct lives, emphasizing wholeness and strength.